But let’s start at the beginning. Long before I knew that Glyndebourne were producing the opera – indeed, before I became interested in Baroque opera at all – I was captivated by a sequence of costume drawings in the British Museum. In particular, I fell in love with a design for the sun-god Apollo, which you see at the top of this post: a gorgeous, fluttering vision of streamers and golden sunbursts. It was from a series of 38 drawings made by the Florentine artist Stefano della Bella, who was court artist to the Medici family in the 17th century. And yet these weren’t designs for a Medici masque, as I first assumed. Instead, they were made for an opera: Hipermestra, staged in 1658 by the Accademia degli Immobili. This was a courtly confraternity devoted to the theatrical arts; its patron was Cardinal Gian Carlo de’ Medici (brother of Grand Duke Ferdinando II de’ Medici), an avid collector and a passionate protector of the theatre. In 1656, the Accademia degli Immobili decided to build a permanent theatre for their productions: the Teatro della Pergola, just north-east of the hospital of Santa Maria Nuova in Florence. It has been a functioning theatre ever since. The first two productions shown in the new building, even before it was fully complete, were comedies (Il Podestà di Colognole and Il Pazzo per Forza). These were set in contemporary Italy and could be staged with simple sets and costumes, but in 1658 the Accademia decided to go for something grander. A son had just been born to King Philip IV of Spain, who’d previously appointed the Cardinal his Generalissimo del Mare (one presumes it was an honorary title). Despite the geographical distance, the birth provided an excuse for a splendid celebration, as was customary for marriages and other court events. And this time it wasn’t going to be an opera buffa about village life. It was going to be something more appropriate for the birth of a prince. The Cardinal initially planned a grand tournament, but Giovanni Andrea Moniglia, the Accademia’s pet librettist, had another idea. He suggested they could put on an opera seria, set in the ancient world and featuring themes of nobility, honour and duty that were fitting for a prince’s nativity. The result was Hipermestra. Although the Accademia’s first two operas had been composed by Jacopo Melani, the powers that be apparently had higher ambitions for their new work. Moniglia’s libretto for Hipermestra was sent off to Venice where, thanks to strings pulled either by the Medici or the Accademia, Francesco Cavalli produced a score in double-quick time. Meanwhile, back in Florence, the Accademia’s committee put their heads together and started discussing the issue of costumes. This is where the British Museum’s drawings come in. They’re remarkable because you can follow the design process from early studies in pen, through more finished drawings with watercolour, to the final stage in the tailor’s workshop. Here, less gifted hands redrew Stefano’s designs, emphasising colours and fabrics to be used. (Sadly this last type of drawing is lost for Hipermestra: I’m extrapolating from drawings which survive for the earlier two operas.) Some tailor’s studies show the careful deconstruction of costumes, such as the doublets shown in two dimensions, ‘unpicked’ for greater clarity. The British Museum drawings all came bound in an album, which was unfortunately dismantled when it first arrived in the 19th century, but the binding is still in the collection. On the front is stamped the coat-of-arms of the Cardinal; on the back, those of the Accademia, with a windmill and the motto ‘In sua movimento è fermo’. Within the binding, still, are those drawings judged by our predecessors to be of insignificant artistic quality – but these include other designs for Hipermestra, in which costumes have been touched with gold to convey the full brilliance of their decoration. We have a hint of what it must have been like to sit in that candlelit theatre: to watch the dancers in the ballets, their costumes enlivened with ribbons that would flow with their movements; or to admire the noble main characters in their costumes, sewn with gold and silver thread, that would have sparkled in the low light. I’ve spent some happy hours studying the British Museum drawings but, while I was in Florence, I wanted to take a look at comparable drawings in the Uffizi, to see if they filled any of the gaps. The British Museum only has designs for certain characters: for example, Hipermestra, but not Danao; Delmiro, but not Linceo; Arbante, but not Elisa (or at least, not named). There are several studies in the Uffizi that can be related either to Hipermestra or to another of the operas performed at the time. Some are clearly copies of drawings in the British Museum; others are glorious works by Stefano at his best. Two in particular really struck me: designs for a dignified older man wearing a crown. Without inscriptions, it’s hard to know whether they were really for Hipermestra (and whether they’re both for the same figure or even the same opera). But at the moment, they’re usually described as ideas for Danao’s costume and they certainly fit the bill. Both are magnificent, executed with a verve and grandeur that’s only really matched by the Apollo at the British Museum, and it was thrilling to see them. So I now had a better idea of the costumes. But there was still one thing I desperately wanted to do. 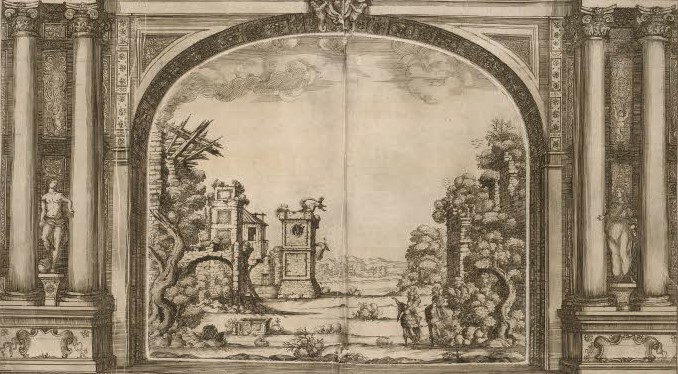 The British Museum has a copy of the souvenir libretto produced for the first performance of Hipermestra, which includes fold-out engravings by Silvio degli Alli showing the opera’s sets. At the back, there’s also a ‘stage eye view’ of the Teatro della Pergola in all its splendour. I longed to see whether the theatre had changed. After a few messages, in which I explained the reason for my interest, I was invited to come and see inside. All I wanted was to have a quick look at the auditorium, but my visit turned into a full adventure. First, my kind guide Matteo invited me up onto the stage so that I could take a picture replicating that in the 1658 engraving. The theatre, incidentally, hasn’t changed much. It looks much smaller in real life, of course, because Silvio degli Algli wasn’t bothered about the correct scale, but the layout is very much the same. And then, to my increasing delight, I was invited behind the scenes. The Pergola has a remarkably deep stage, because it was built specifically as an opera theatre and designed to offer graceful perspectives and space for lots of different sets and backdrops. Matteo took me through a small door at the side of the stage and down some stairs, straight back – so it felt – into the 17th century. Beneath the Pergola there’s a warren of vaults and storerooms that can’t have changed much since Hipermestra‘s day. The electric light is still extremely limited: as we looked around, Matteo often had to use the light on his phone to help us navigate steps and uneven floors. It was magical. In one room, Matteo showed me a trio of Baroque-style special-effects: a wind-machine, where you turn a wheel inside a canvas strip, giving a roaring sound; a thunder-machine, which is basically a sheet of metal which you hit like a gong; and a third which I couldn’t quite figure out. In a nearby room, you could once access the theatre’s well (now covered up): a crucial safety measure in the days when theatres were lit by candles and oil lamps and had a habit of going up in flames. Nearby, a wide ramp curved up into darkness. This, Matteo explained, was how horses were taken up onto the stage – remember the very deep set? Many operas would have provided excuses for entrances on horseback, or perhaps even displays of dressage: a 19th or early 20th-century poster advertising equestrian and canine performances still hangs on the wall of the ramp. Next we explored a sequence of storerooms or workshops leading off a main lane that ran beneath the theatre. Matteo told me to remember that a theatre expands far beyond its stage: it’s a whole city of embroiderers, tailors, engineers and carpenters. As the warren of rooms was swallowed up in darkness behind me, I tried very hard not to think of The Phantom of the Opera. But there was one final surprise: a little museum, tucked away down a small flight of stairs. Here Matteo showed me a cut-away model of the theatre’s original decoration, dating from the 17th century. In the centre of the museum room was a vast wooden wheel set in the floor, attached to a capstan. 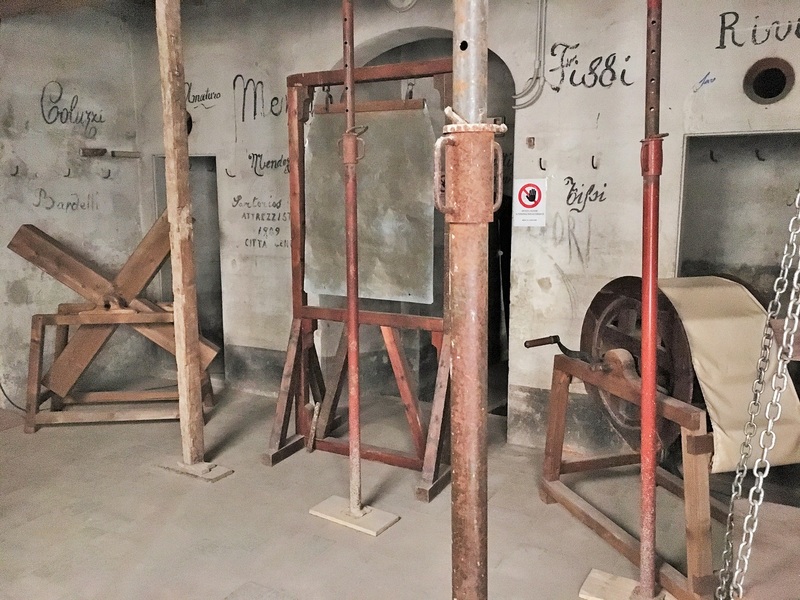 Matteo explained that it took four strong men to move the capstan and that, in the old days, turning the wheel would raise the entire floor of the theatre so that it became level with the stage and transformed the auditorium into a ballroom. By the time we emerged into the gallery at the top of the theatre, and rested a moment in the velvet seats, my head was spinning. I’d never imagined that the Pergola would still be so full of history and so carefully preserved. Although the auditorium has been updated and renovated, it’s all too easy to imagine the magic of watching Hipermestra on its stage. Unfortunately the theatre doesn’t have any operas in its immediate schedule but, as you can imagine, I’m going to be keeping a sharp eye on its future programming. I had one more Pergola-related treat. On my final day in Florence, I visited the theatre’s study centre and worked my way through their archives relating to Hipermestra and the Accademia’s other early operas. It isn’t possible to take photos, so you’ll just have to take it from me that it was wonderful. There were no overwhelming discoveries, but I’m the kind of strange person who gets a thrill from reading 17th-century documents, and it was delightful to find out little details about the first performance. I particularly enjoyed the Diario di tutti gli Abiti dell’ Hipermestra, in which the unknown author describes each character’s costume, in order of their appearance, from the colour and material of their stockings down to what they carried in their hand. It offered fuller descriptions than I’ve had to date, and will help me expand the catalogue entries of the related drawings. Silvio degli Alli, The set for Act III of Hipermestra, showing Hipermestra throwing herself from the tower. Folded engraving from the 1658 libretto in the British Museum. For those who have seen the Glyndebourne production, note the peacock beside the tower. Then there were cast lists, not of the main roles (sadly) but of the attendants for every single named character. (The stage must have been positively overcrowded.) The actors seemed to be divided by parish or contrade: Linceo’s eight attendants all came from the parish of the Duomo, ‘S.M. del Fiore‘, as did Danao’s eight; while Arbante’s entourage of six came from the parish of the Baptisery ‘S. Giovanni‘ and those of Delmiro (who also had six) from S. Lorenzo. Danao and Linceo also had five pages each, while Hipermestra had three, all of whom were listed with their addresses, presumably because they were minors. And, while looking at the list of ladies accompanying Hipermestra (there were six), I noticed something interesting. These, along with Elisa’s ladies, Venus’s nymphs, Apollo’s Hours, and Thetis’s nereids, were all played by boys (Hipermestra’s first lady is listed as Lorenzo di Filippo Mansi, presumably a tailor’s assistant, whose address was ‘bottega del sarto del Granduca‘). And all sorts of people seemed to want to get involved in the show. Gelosia, for whom we have a costume design decorated with eyes in the British Museum, was played by a priest from Santissima Annunziata, Fra Giovanni Francesco ‘della Nuntiata‘, who doubled up as a Cyclops later in the performance. Of course we can never truly recreate an opera performed 350 years ago, but through these drawings and prints, and thanks to the remarkable preservation of the Teatro della Pergola, it’s almost possible to imagine yourself back in June 1658. It was history-geek heaven, and a fantastic research trip that will prove very useful for my cataloguing. What a delightful experience! Those cast lists sound especially interesting. The divisions you mention make me wonder if the unrecorded players of the main roles came from the same parishes as their attendants, or if these arrangements were simply a manifestation of local politics without any relation to the musical side of the performance. I’m not sure at present who the main singers were, but I would think it very likely that they were professionals attached to the Medici court and thus exempt from contrade politics. They may not even have been Florentine.